Those with Sensory Processing Disorder have a difficult with filtering out the senses in the brain to make sense of the World around them. One of the areas this can cause difficulties is with hygiene. I thought that I would share my thoughts on how to best help deal with Sensory Processing Disorder and brushing teeth. The Sensory Seeker used to hate having his teeth brushed, would scream, fight and refuse – even to the point of nearly being sick. Fast forward on a bit and now he is asking to have his teeth cleaned. Here I consider what happened to change that. 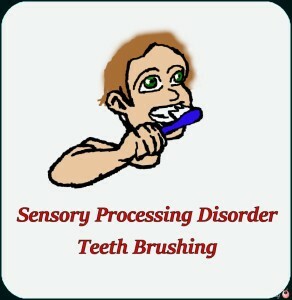 Sensory Processing Disorder Brushing Teeth: What is the Problem? You need to consider what the problem actually is. In this case The Sensory Seeker has little oral awareness. This can also be seen at mealtimes when he stuffs as much food as possible into his mouth all at once. Our oldest son also had this; he would drool lots until all his mouth was sore and his clothes were soaked. Before even thinking about going as far as brushing teeth, things that can help are by providing different sensory inputs for the mouth – this can be with different textured foods or chewy toys or even try ice. If there is an aversion to things going into the mouth then try to discover exactly where the problem is – is it the lips, inside the mouth, the tip of the tongue, the middle of the tongue, the gums, or all of the above, that is causing the problem? I am sure it seems like such an obvious thing to say but having The Sensory Seeker on-board to the idea of brushing his teeth is the first step. Now it is much easier as he has a bit of an understanding that he needs to look after them. I am not quite sure how this happened, or to what extent, but since losing his first tooth it has been much easier to get him into the bathroom. Before this, or if he is in a defiant mood then we use bribery rewards. This may be that he can play with Lego when we are finished, it may be to watch his favourite TV show, even to leave some of his breakfast – we give him some control back to get what he wants if he does what we want. You may want to get them to agree in stages – entering the bathroom one day, massaging their gums another, rubbing toothpaste on their gums after that, until you slowly progress to a toothbrush. You have to remember that the problem may be the bathroom itself. If you were to enter my bathroom you may feel that it is too cold for you. If this were your house you’d probably put something on warmer or turn on the heating. Those with Sensory Processing Disorder may not understand what the problem is though, or know how to fix it. What if you haven’t got the tools to fix it either? I think it is important to stand where you will be brushing teeth and put yourself in their position. 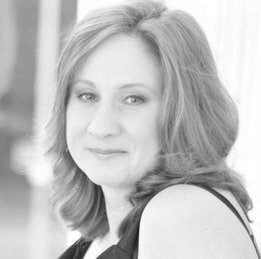 Think – is the bathroom cluttered? How does the colour make you feel? What is the temperature like? How does it smell? What are textures like? What is the flooring made of? Are there any sounds? An extractor fan or an open window? Is there a tap running? Too many sounds from other people? Is there not enough noise? Could you put some music on? You need to think about each individual with Sensory Processing Disorder as they may be a Seeker or Avoider or a bit of both. Really think about what they require for their Sensory Diet. Maybe you could brush their teeth in another room (a smaller one) or even start in their favourite room or sensory den (just take a bowl for them to spit in to). I noticed this morning that The Sensory Seeker uses the training step for moving up and down, and around whilst brushing his teeth, but that also he makes tapping sounds with his foot on it. 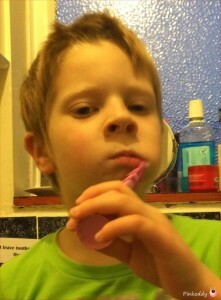 It took us a long time of trying many different toothbrushes and pastes before we found ones he was happy with. There are many different sizes, textures, colours, smells of paste and brushes you can ones that spin, musical, electric and main colours and shapes. We even tried electric ones. In the end I think it was the control The Sensory Seeker had over the situation and now he has a choice of brushes and paste in the morning. Again think about the individuals need. Let them familiarise themselves with the toothbrush and paste – even if that means letting them play with the paste – without even getting any in their mouth. We did as above and had a slow build up. One of the best products we found for The Sensory Seeker was a brush that slid over the finger. We always wet the brush before adding paste – do you do this? If so have you considered the temperature of the water? Have you tried it without? If you do not put water on then – have you considered the temperature and feel of the brush – could water help? 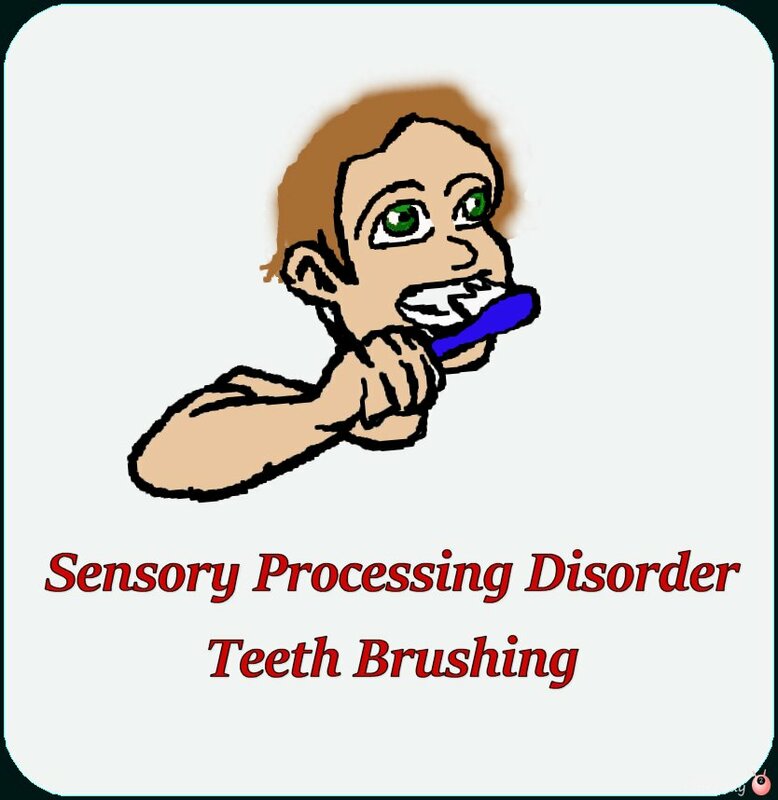 Control is an important aspect of successfully brushing teeth for the individual with Sensory Processing Disorder. 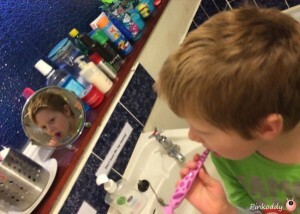 I think that our success with getting The Sensory Seeker brushing teeth was when he could see himself in the mirror. He knew what was going to happen and could see exactly where the brush was being moved to. It also gives him the control of how much pressure the brush puts on him. Now he likes to brush his teeth at the same time as me, using me as a model and mirroring where I move the brush. Prior to that I also held him firmly under the chin – and think this helped with the tactile sense. I have to admit myself that sometimes brushing my teeth makes my nose itch. Again communication has played a big part in this development. 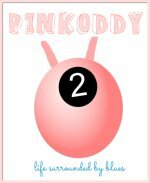 Letting The Sensory Seeker know how long it would happen – starting small and then building up. You could do this by letting them count or sing. Sand timers are great though, as they are visual display of the time that would be required to be brushing teeth. Another good visual is disclosing tablets that colour the teeth and gums so that they can see where they need to brush to get rid of the plaque. There are some with Sensory Processing Disorder that none of the above works. The only way to get their teeth done is to restrain them and get the job done. I think that if this is the case you just have to remember how much more difficult it would be if they had to have work done at the dentist – an unfamiliar place with new noises, smells, textures. If you have a problem with Brushing Teeth I would love to know in the comments below all about it. Or alternatively can you help give any further advice on this issue?